This article is about the concept of a savior. For the oratorio by George Frideric Handel, see Messiah (Handel). For other uses, see Messiah (disambiguation). 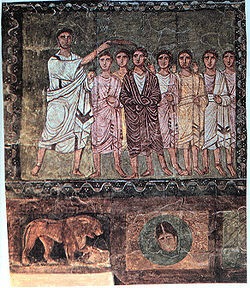 Samuel anoints David, Dura Europos, Syria, Date: 3rd century CE. In Abrahamic religions, a messiah or messias (Hebrew: מָשִׁיחַ‎, translit. māšîaḥ; Greek: μεσσίας, translit. messías, Arabic: مسيح‎, translit. masîḥ) is a saviour or liberator of a group of people. The concepts of moshiach, messianism, and of a Messianic Age originated in Judaism, and in the Hebrew Bible; a moshiach (messiah) is a king or High Priest traditionally anointed with holy anointing oil. Messiahs were not exclusively Jewish: the Book of Isaiah refers to Cyrus the Great, king of the Achaemenid Empire, as a messiah for his decree to rebuild the Jerusalem Temple. Ha mashiach (המשיח, 'the Messiah', 'the anointed one'),[a] often referred to as melekh mashiach (מלך המשיח 'King Messiah'), is to be a human leader, physically descended from the paternal Davidic line through King David and King Solomon. He is thought to accomplish predetermined things in only one future arrival, including the unification of the tribes of Israel, the gathering of all Jews to Eretz Israel, the rebuilding of the Temple in Jerusalem, the ushering in of a Messianic Age of global universal peace, and the annunciation of the world to come. In Christianity, the Messiah is called the Christ, from Greek: χριστός, translit. khristós, translating the Hebrew word of the same meaning. The concept of the Messiah in Christianity originated from the Messiah in Judaism. However, unlike the concept of the Messiah in Judaism, the Messiah in Christianity is the Son of God. Christ became the accepted Christian designation and title of Jesus of Nazareth, because Christians believe that the messianic prophecies in the Old Testament were fulfilled in his mission, death, and resurrection. These specifically include the prophecies of him being descended from the Davidic line, and being declared King of the Jews which happened on the day of his crucifixion. They believe that Christ will fulfill the rest of the messianic prophecies, specifically that he will usher in a Messianic Age and the world to come at his Second Coming. In Islam, Jesus was a prophet and the Masîḥ (مسيح), the Messiah sent to the Israelites, and he will return to Earth at the end of times, along with the Mahdi, and defeat al-Masih ad-Dajjal, the false Messiah. 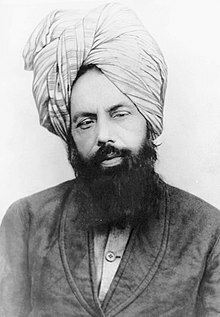 In Ahmadiyya theology, these prophecies concerning the Mahdi and the second coming of Jesus have been fulfilled in Mirza Ghulam Ahmad (1835–1908), the founder of the Ahmadiyya Movement, and the terms 'Messiah' and 'Mahdi' are synonyms for one and the same person. In Chabad messianism, Yosef Yitzchak Schneersohn (r. 1920–1950), sixth Rebbe (spiritual leader) of Chabad Lubavitch, and Menachem Mendel Schneerson (1902–1994), seventh Rebbe of Chabad, are Messiah claimants. Resembling early Christianity, the deceased Schneerson is believed to be the Messiah among some adherents of the Chabad movement; his second coming is believed to be imminent. al-Masīḥ (proper name, pronounced [maˈsiːħ]) is the Arabic word for messiah. In modern Arabic, it is used as one of the many titles of Jesus. Masīḥ is used by Arab Christians as well as Muslims, and is written as Yasūʿ al-Masih (يسوع المسيح) by Arab Christians or ʿĪsā al-Masīḥ (عيسى المسيح) by Muslims. The word al-Masīḥ literally means "the anointed", "the traveller", or the "one who cures by caressing". The literal translation of the Hebrew word mashiach (messiah) is "anointed", which refers to a ritual of consecrating someone or something by putting holy oil upon it. It is used throughout the Hebrew Bible in reference to a wide variety of individuals and objects; for example, kings, priests and prophets, the altar in the Temple, vessels, unleavened bread, and even a non-Jewish king (Cyrus the Great). In Jewish eschatology, the term came to refer to a future Jewish king from the Davidic line, who will be "anointed" with holy anointing oil, to be king of God's kingdom, and rule the Jewish people during the Messianic Age. In Judaism, the Messiah is not considered to be God or a pre-existent divine Son of God. He is considered to be a great political leader that has descended from King David. That is why he is referred to as Messiah ben David, which means "Messiah, son of David". The messiah, in Judaism, is considered to be a great, charismatic leader that is well oriented with the laws that are followed in Judaism. He will be the one who will not "judge by what his eyes see" or "decide by what his ears hear". Belief in the eventual coming of a future messiah is a fundamental part of Judaism, and is one of Maimonides' 13 Principles of Faith. And if a king shall arise from among the House of David, studying Torah and occupied with commandments like his father David, according to the written and oral Torah, and he will impel all of Israel to follow it and to strengthen breaches in its observance, and will fight God's wars, this one is to be treated as if he were the anointed one. If he succeeded and built the Holy Temple in its proper place and gathered the dispersed ones of Israel together, this is indeed the anointed one for certain, and he will mend the entire world to worship the Lord together, as it is stated: "For then I shall turn for the nations a clear tongue, so that they will all proclaim the Name of the Lord, and to worship Him with a united resolve (Zephaniah 3:9)." Even though the eventual coming of the messiah is a strongly upheld belief in Judaism, trying to predict the actual time when the messiah will come is an act that is frowned upon. These kinds of actions are thought to weaken the faith the people have in the religion. So in Judaism, there is no specific time when the messiah comes. Rather, it is the acts of the people that determines when the messiah comes. It is said that the messiah would come either when the world needs his coming the most (when the world is so sinful and in desperate need of saving by the messiah) or deserves it the most (when genuine goodness prevails in the world). A common modern rabbinic interpretation is that there is a potential messiah in every generation. The Talmud, which often uses stories to make a moral point (aggadah), tells of a highly respected rabbi who found the Messiah at the gates of Rome and asked him, "When will you finally come?" He was quite surprised when he was told, "Today." Overjoyed and full of anticipation, the man waited all day. The next day he returned, disappointed and puzzled, and asked, "You said messiah would come 'today' but he didn't come! What happened?" The Messiah replied, "Scripture says, 'Today, if you will but hearken to his voice.'" A Kabbalistic tradition within Judaism is that the commonly discussed messiah who will usher in a period of freedom and peace, Messiah ben David, will be preceded by Messiah ben Joseph, who will gather the children of Israel around him, lead them to Jerusalem. After overcoming the hostile powers in Jerusalem, Messiah ben Joseph, will reestablish the Temple-worship and set up his own dominion. Then Armilus, according to one group of sources, or Gog and Magog, according to the other, will appear with their hosts before Jerusalem, wage war against Messiah ben Joseph, and slay him. His corpse, according to one group, will lie unburied in the streets of Jerusalem; according to the other, it will be hidden by the angels with the bodies of the Patriarchs, until Messiah ben David comes and brings him back to life. Yosef Yitzchak Schneersohn (r. 1920 - 1950), sixth Rebbe (spiritual leader) of Chabad Lubavitch, and Menachem Mendel Schneerson (1902 - 1994), seventh Rebbe of Chabad, are messiah claimants. As per Chabad-Lubavitch messianism, Menachem Mendel Schneerson openly declared his deceased father-in-law, the former 6th Rebbe of Chabad Lubavitch, to be the Messiah. He published about Yosef Yitzchak Schneersohn to be "Atzmus u'mehus alein vi er hat zich areingeshtalt in a guf" (Yiddish and English for: "Essence and Existence [of God] which has placed itself in a body"). The gravesite of his deceased father-in-law Yosef Yitzchak Schneersohn, known as "the Ohel", became a central point of focus for Menachem Mendel Schneerson's prayers and supplications. 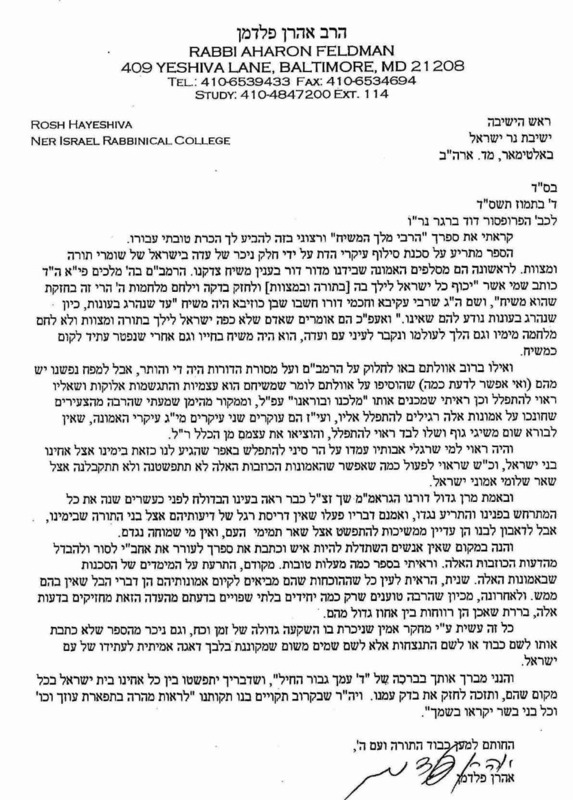 Regarding the deceased Menachem Mendel Schneerson, a later Chabad Halachic ruling claims that it was "incumbent on every single Jew to heed the Rebbe's words and believe that he is indeed King Moshiach, who will be revealed imminently". Outside of Chabad messianism, in Judaism, there is no basis to these claims. If anything, this resembles the faith in the resurrection of Jesus and his second coming in early Christianity. Still today, the deceased rabbi Menachem Mendel Schneerson is believed to be the Messiah among adherents of the Chabad movement, and his second coming is believed to be imminent. He is venerated and invocated to by thousands of visitors and letters each year at two bamot-tombs (Ohel), especially in a pilgrimage each year on the anniversary of his death. The Greek translation of Messiah is khristos (χριστός), anglicized as Christ, and Christians commonly refer to Jesus as either the "Christ" or the "Messiah". Christians believe that messianic prophecies were fulfilled in the mission, death, and resurrection of Jesus and that he will return to fulfill the rest of messianic prophecies. The majority of historical and mainline Christian theologies consider Jesus to be the Son of God and God the Son, a concept of the Messiah fundamentally different from the Jewish and Islamic concepts. In each of the four New Testament Gospels, the only literal anointing of Jesus is conducted by a woman. In the Gospels of Mark, Matthew, and John, this anointing occurs in Bethany, outside Jerusalem. In the Gospel of Luke, the anointing scene takes place at an indeterminate location, but context suggests it to be in Galilee, or even a separate anointing altogether. While the term "messiah" does appear in Islam, the meaning is different from that found in Christianity and Judaism. "Though Islam shares many of the beliefs and characteristics of the two Semitic/Abrahamic/monotheistic religions which preceded it, the idea of messianism, which is of central importance in Judaism and Christianity, is alien to Islam as represented by the Qur'an." The Quran identifies Jesus (Isa) as the messiah (Masih), who will one day return to earth. At the time of the second coming, "according to Islamic tradition, Jesus will come again and exercise his power of healing. He will forever destroy falsehood, as embodied in the Daj-jal, the great falsifier, the anti-Christ. Then God will reign forever." Jesus is one of the most important prophets in the Islamic tradition, along with Noah, Abraham, Moses, and Muhammad. [Quran 33:7][Quran 42:13-14][Quran 57:26] Unlike Christians, Muslims see Jesus as merely a prophet, but not as God himself or the son of God. Like all other prophets, Jesus is an ordinary man, who receives revelations from God. According to religious scholar Mona Siddiqui, in Islam, "Prophecy allows God to remain veiled and there is no suggestion in the Qur'an that God wishes to reveal of himself just yet. Prophets guarantee interpretation of revelation and that God's message will be understood." Prophecy in human form does not represent the true powers of God, contrary to the way Jesus is depicted in mainstream Christianity. The Quran states that Isa, the Son of Maryam (Arabic: Isa ibn Maryam), is the messiah and prophet sent to the Children of Israel. [Quran 3:45] The birth of Isa is described in Quran sura 19 verses 1–33,[Quran 19:1-33] and sura 4 verse 171 explicitly states Isa as the Son of Maryam. [Quran 4:171] Sunni Muslims believe Isa is alive in Heaven and did not die in the crucifixion, as depicted in mainstream Christianity. According to religious scholar Mahmoud Ayoub, "Jesus' close proximity or nearness (qurb) to God is affirmed in the Qur'anic insistence that Jesus did not die, but was taken up to God and remains with God"  The Quran in sura 4 verse 157-158 states that: "They did not kill him, nor did they crucify him, but they thought they did" since the messiah was "made to resemble him to them." It is believed that Isa will return to Earth to defeat the Masih ad-Dajjal (false Messiah), a figure similar to the Antichrist in Christianity, who will emerge shortly before Yawm al-Qiyāmah ("the Day of Resurrection"). The Mahdi will come shortly before the second coming of Jesus. After he has destroyed ad-Dajjal, his final task will be to become leader of the Muslims. Isa will unify the Muslim Ummah (the followers of Islam) under the common purpose of worshipping Allah alone in pure Islam, thereby ending divisions and deviations by adherents. Mainstream Muslims believe that at that time Isa will dispel Christian and Jewish claims about him. The Prophet said: There is no prophet between me and him, that is, Isa. He will descend (to the earth). When you see him, recognise him: a man of medium height, reddish fair, wearing two light yellow garments, looking as if drops were falling down from his head though it will not be wet. He will fight the people for the cause of Islam. He will break the cross, kill swine, and abolish jizyah. Allah will perish all religions except Islam. 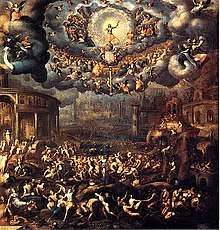 He will destroy the Antichrist and will live on the earth for forty years and then he will die. The Muslims will pray over him. Both Sunni and Shia Muslims agree that al-Mahdi will arrive first, and after him, Isa. Isa will proclaim al-Mahdi as the Islamic community leader. A war will be fought—the Dajjal against al-Mahdi and Isa. This war will mark the approach of the coming of the Last Day. After Isa slays al-Dajjāl at the Gate of Lud, he will bear witness and reveal that Islam is indeed the true and last word from God to humanity as Yusuf Ali's translation reads: "And there is none of the People of the Book but must believe in him before his death; and on the Day of Judgment he will be a witness against them. "[Quran 4:159] A hadith in Sahih Bukhari says: "Allah's Apostle said "How will you be when the son of Mariam descends among you and your Imam is from among you?" "
Shi'i Islam, which significantly values and revolves around the 12 spiritual leaders called Imams, differs significantly from the beliefs of Sunni Islam. Unlike Sunni Islam, "Messianism is an essential part of religious belief and practice for almost all Shi'a Muslims." Shi'i Islam believes that the last Imam will return again, with the return of Jesus. According to religious scholar Mona Sidique, "Shi'is are acutely aware of the existence everywhere of the twelfth Imam, who disappeared in 874. Shi'i piety teaches that the hidden Imam will return with Jesus Christ to set up the messianic kingdom before the final Judgement Day, when all humanity will stand before God. There is some controversy as to the identity of this imam. There are sources that underscore how the Shia sect agrees with the Jews and Christians that Imam Mehdi (al-Mahdi) is another name for Elijah, whose return prior to the arrival of the Messiah was prophesied in the Old Testament. On the other hand, there is also belief from among Shia and Sunni adherents that the imam will be Muhammad. The Imams and Fatima will have a direct impact on the judgements rendered that day. This will represent the ultimate intercession." There is debate on whether Shi'i Muslims should accept the death of Jesus. Religious scholar Mahmou Ayoub argues "Modern Shi'i thinkers have allowed the possibility that Jesus died and only his spirit was taken up to heaven." Conversely, religious scholar Mona Siddiqui argues that Shi'i thinkers believe Jesus was "neither crucified nor slain." She also argues that Shi'i Muslims believe that the twelfth imam did not die, but "was taken to God to return in God's time,"  and "will return at the end of history to establish the kingdom of God on earth as the expected Mahdi." In Ahmadiyya theology, the terms "Messiah" and "Mahdi" are synonymous terms for one and the same person. The term "Mahdi" means guided by God, thus implying a direct ordainment by God of a divinely chosen individual. According to Ahmadiyya thought, Messiahship is a phenomenon through which a special emphasis is given on the transformation of a people by way of offering suffering for the sake of God instead of giving suffering (i.e. refraining from revenge). Ahmadis believe that this special emphasis was given through the person of Jesus and Mirza Ghulam Ahmad (1835–1908) among others. Ahmadis hold that the prophesied eschatological figures of Christianity and Islam, the Messiah and Mahdi, were in fact to be fulfilled in one person who was to represent all previous prophets. Numerous hadith are presented by the Ahmadis in support of their view, such as one from Sunan Ibn Majah, which says, "There is No Mahdi other than Jesus son of Mary." Ahmadis believe that the prophecies concerning the Mahdi and the second coming of Jesus have been fulfilled in Mirza Ghulam Ahmad (1835–1908), the founder of the Ahmadiyya Movement. Unlike mainstream Muslims, the Ahmadis do not believe that Jesus is alive in heaven, but that he survived the crucifixion and migrated towards the east where he died a natural death and that Ghulam Ahmad was only the promised spiritual second coming and likeness of Jesus, the promised Messiah and Mahdi. He also claimed to have appeared in the likeness of Krishna and that his advent fulfilled certain prophecies found in Hindu scriptures. He stated that the founder of Sikhism was a Muslim saint, who was a reflection of the religious challenges he perceived to be occurring. Ghulam Ahmad wrote Barahin-e-Ahmadiyya, in 1880, which incorporated Indian, Sufi, Islamic and Western aspects in order to give life to Islam in the face of the British Raj, Protestant Christianity, and rising Hinduism. He later declared himself the Promised Messiah and the Mahdi following Divine revelations in 1891. Ghulam Ahmad argued that Jesus had appeared 1300 years after the formation of the Muslim community and stressed the need for a current Messiah, in turn claiming that he himself embodied both the Mahdi and the Messiah. Ghulam Ahmad was supported by Muslims who especially felt oppressed by Christian and Hindu missionaries. In Buddhism, Maitreya is considered to the next Buddha (awakened one) that is promised to come. He is expected to come to renew the laws of Buddhism once the teaching of Gautama Buddha has completely decayed. Bahá'u'lláh, founder of the Bahá'í Faith, claimed to be the figure prophesied in the scriptures of the world's religions. His name, when translated literally, means "The Glory of God" in Arabic. According to the Bahá'í Faith, Bahá'u'lláh addressed not only those timeless theological and philosophical questions that have stayed with humanity since old times such as: Who is God? What is goodness? and Why are we here? but also the questions that have preoccupied philosophers of the 20th century: What motivates human nature? Is real peace indeed possible? Does God still care for humanity? and the like. He taught that there is only one God, that all of the world's religions are from God, and that now is the time for humanity to recognize its oneness and unite. Emperor Haile Selassie I of Ethiopia is believed to be the Messiah by followers of the Rastafari movement. This idea further supports the belief that God himself is black, which they (followers of the Rastafarian movement) try to further strengthen by a verse from the Bible. [Jeremiah 8:21]. Even if the Emperor denied being the messiah, the followers of the Rastafari movement believe that he is a messenger from God. To justify this, Rastafarians used reasons such as Emperor Haile Selassie's bloodline, which is assumed to come from King Solomon of Israel, and the various titles given to him, which include Lord of Lords, King of Kings and Conquering Lion of the tribe of Judah. In Kebatinan (Javanese religious tradition), Satrio Piningit is a character in Jayabaya's prophecies who is destined to become a great leader of Nusantara and to rule the world from Java. In Serat Pararaton, King Jayabaya of Kediri foretold that before Satrio Piningit's coming, there would be flash floods and that volcanoes would erupt without warning. Satrio Piningit is a Krishna-like figure known as "Ratu Adil" (Indonesian King of Justice) and his weapon is a trishula. ^ The specific expression ha mashiach does not occur in the Tanakh. ^ a b Schochet, Jacob Immanuel. "Moshiach ben Yossef". Tutorial. moshiach.com. Archived from the original on 20 December 2002. Retrieved 2 December 2012. ^ a b Blidstein, Prof. Dr. Gerald J. "Messiah in Rabbinic Thought". Messiah. Jewish Virtual Library and Encyclopaedia Judaica 2008 The Gale Group. Retrieved 2 December 2012. ^ "Cyrus". Jewish Encyclopedia (1906). "This prophet, Cyrus, through whom were to be redeemed His chosen people, whom he would glorify before all the world, was the promised Messiah, 'the shepherd of Yhwh' (xliv. 28, xlv. 1)." ^ Telushkin, Joseph. "The Messiah". The Jewish Virtual Library Jewish Literacy. NY: William Morrow and Co., 1991. Reprinted by permission of the author. Retrieved 2 December 2012. ^ "The Jewish Concept of Messiah and the Jewish Response to Christian Claims - Jews For Judaism". jewsforjudaism.org. Jews For Judaism. Retrieved 31 August 2016. ^ Flusser, David. "Second Temple Period". Messiah. Encyclopaedia Judaica 2008. The Gale Group. Retrieved 2 December 2012. ^ Jesus of Nazareth, the central figure of Christianity, born c. 4 BC. ^ a b "Muttaqun OnLine - Dajjal (The Anti-Christ): According to the Qur'an and Sunnah". Muttaqun.com. Retrieved 9 November 2012. ^ a b c Dara Horn, June 13, 2014 "Rebbe of Rebbe's". The Wall Street Journal. ^ a b c Aharon Lichtenstein, Euligy for the Rebbe. June 16, 1994. ^ a b c d Berger, Rabbi Prof. Dr. David. "On the Spectrum of Messianic Belief in Contemporary Lubavitch Chassidism". Shema Yisrael Torah Network. Retrieved 3 July 2016. ^ a b Freeman, Charles. The Closing of the Western Mind, p. 133. Vintage. 2002. ^ a b c d e Bar-Hayim, HaRav David. "The False Mashiah of Lubavitch-Habad". Machon Shilo (Shilo Institute). Retrieved 17 June 2016. ^ a b c d e Bar-Hayim, HaRav David. "Habad and Jewish Messianism (audio)". Machon Shilo (Shilo Institute). Retrieved 17 June 2016. ^ Badawi, Elsaid; Haleem, Muhammad Abdel (2008). Arabic–English Dictionary of Qur'anic Usage. Koninklijke Brill. p. 881. ^ "Judaism 101: Mashiach: The Messiah". Jewfaq.org. Retrieved 2 May 2014. ^ a b "Judaism 101: Mashiach: The Messiah". Jewfaq.org. Retrieved 9 November 2012. ^ "Messiah". Jewish Encyclopedia. 1906. Retrieved 2 May 2014. ^ The New York Times, Statement From Agudas Chasidei Chabad, Feb 9, 1996. ^ Likutei Sichos, Vol 2, pp. 510-511. ^ Identifying Chabad : what they teach and how they influence the Torah world (Revised ed.). Illinois: Center for Torah Demographics. 2007. p. 13. ISBN 978-1411642416. Retrieved 29 June 2016. ^ Singer, HaRav Tovia. "Why did some expect the Lubavitcher Rebbe to Resurrect as the Messiah? Rabbi Tovia Singer Responds (video-lecture)". Tovia Singer Youtube.com. Retrieved 26 June 2016. ^ "Halachic Ruling". Psak Din. Retrieved March 22, 2014. ^ Gryvatz Copquin, Claudia (2007). The Neighborhoods of Queens. Yale University Press. pp. 20–23. ISBN 0-300-11299-8. ^ a b Hassan, Riffat (Spring 1985). "Messianism and Islam" (PDF). Journal of Ecumenical Studies. 22:2: 263. ^ a b c d Albert, Alexander. "Orientating, Developing, and Promoting an Islamic Christology". FIU Electronic Theses and Dissertations. Retrieved 1 May 2014. ^ a b c Ayoub, Mahmoud (2007). A Muslim View of Christianity: Essays on Dialogue. Maryknoll, NY: Orbis Books. p. 115. ISBN 978-1-57075-690-0. ^ Wensick, A.J. (2012). "al- Masih". Encyclopedia of Islam. ^ a b c d e Siddiqui, Mona (2013). Christians, Muslims, and Jesus. Yale University Press. p. 12. ISBN 978-0-300-16970-6. ^ a b "The Holy Quran". Alislam.org. Retrieved 9 November 2012. ^ Kendal, Elizabeth (2016). After Saturday Comes Sunday: Understanding the Christian Crisis in the Middle East. Eugene, OR: Resource Publications. p. 29. ISBN 9781498239882. ^ Khalidi, Tarif (2001). Muslim Jesus. President and Fellows of Harvard College. p. 25. ISBN 0-674-00477-9. ^ "Sunni and Shi'a". BBC. Retrieved 1 May 2014. ^ a b Abbas, Muhammad (2007). Israel: The History and How Jews, Christians and Muslims Can Achieve Peace. New York: iUniverse. ISBN 9780595426195. ^ Bill, James; Williams, John Alden (2002). Roman Catholics and Shi'i Muslims. The University of North Carolina Press. pp. 57–58. ISBN 0-8078-2689-8. ^ ""Mahdi" in a Special Meaning and Technical Usage". Ahlul Bayt Digital Islamic Library Project. Retrieved 30 April 2014. ^ "Jesus: A humble prophet of God". Ahmadiyya Muslim Community. Retrieved 30 April 2014. ^ a b Robinson, Francis. "Prophets without honour? Ahmad and the Ahmadiyya". History Today. 40 (June): 46. ^ "Maitreya (Buddhism)". Encyclopædia Britannica Online. Encyclopædia Britannica. Retrieved 2 May 2014. ^ Momen, Moojan (2004). "Baha'i Faith and Holy People". In Jestice, Phyllis G. Holy People of the World: A Cross-cultural Encyclopedia. Santa Barbara, CA: ABC-CLIO. ISBN 1-57607-355-6. ^ "Bahá'u'lláh - History". Archived from the original on 13 July 2014. Retrieved 2 May 2014. ^ "The life of Baha'u'llah". www.Baha'i.org. Retrieved 2 May 2014. ^ "Haile Selassie I - God of the Black race". BBC News. Retrieved 2 May 2014. Aryeh Kaplan, From Messiah to Christ, New York: Orthodox Union, 2004. Joseph Klausner, The Messianic Idea in Israel from Its Beginning to the Completion of the Mishnah, London: George Allen & Unwin, 1956. Jacob Neusner, William S. Green, Ernst Frerichs, Judaisms and their Messiahs at the Turn of the Christian Era, Cambridge: Cambridge University Press, 1987.